In constrained environments such as Malaysia, government information on key issues are hard to come by, much less as open data (where Malaysia is now ranked #112, down from #98 the year before for OKFN's Open Data Index). Mostly hard to get information is one in which there is possible element of corruption, or data that can show poor performance of government in areas that are particular concern to the public. Information such as lop sided tolled highway concessions, crime statistics, pollution and wastage of public funds. Public perception is that such information and data is not available, or under an Official Secrets Act. This is not always true, there is in fact a wealth of data and statistics hidden in official parliamentary replies. There are interesting ways to get supposedly secret or unavailable information without Freedom of Information Act with well placed questions by Members of Parliament (MPs). We came to learn that a lot of parliamentary news stories or statements from MPs were being written citing various statistics from parliament, but could not find any of the original sources. This lead the team to find out that there are written replies to parliamentary questions to MPs which are printed and handed out to all MPs, but are not available on-line for the public. In partnership, with the research team of the office of MP Serdang, Ong Kian Ming, we got hold of the scanned documents by their team and made the full text of the documents searchable on-line on the pardocs.sinarproject.orgwebsite. There are now over 5000 replies to MP questions available. Since 2013 alone, MP's have asked for crime information and statistics over 377 times in parliament. When MP's ask for detailed statistics, especially for range of several years, they will be able to good set of data as part of their parliamentary replies, which can be converted into open data. When made available as open data on a shared website, it will reduce repeated questions by different MPs, and will enable them to ask for new unavailable information instead. If the questions are phrased in a way that is too specific such as a specific area for a month, then general numbers in replies are less useful and don't help to contribute to larger body of missing data. All the other MPs then will be wasting time asking for info on different areas. It also makes the task harder for civil society to put key figures together from dozens of different parliamentary replies. It is recommended that constituents and their MPs coordinate to ask for information for every area in their state by constituency or particular subject such as crime, and for several years for every category that they can think of would be useful. To get around Official Secrets Act that mask corruption such as lopsided deals on tolled highways or projects, MPs for example can ask about government expenditure, related to such deals which can be shared. Government expenditure breakdown is key information that is not published by Malaysian government. More MPs need to ask questions on expenditure data for key departments and or projects. With enough detailed data on expenditure, researchers can figure out some of the conditions and percentages of such deals, or see gaps for which additional questions could be asked in Parliament. It is recommended that constituents and MPs coordinate to ask for detailed expenditure breakdown on projects or agreements to uncover points covered by secret agreements. PAC Reports are another large source of open data on key issues related to governance and corruption. These documents can be mined for data that complies to Popolo government standards into central database such as Popit. They are a source of Politically Exposed Persons (PEPs) and positions they hold in various companies, obscure government committees, agencies, departments and private companies and individuals for which contracts were provided and never held accountable. For example, who are the directors & companies involved in KLIA2 airport cost overruns? If they are made easily available as open data, analysis can be done with joined up data and selective MP questions to find out if they are still awarded contracts or currently holding key government positions. 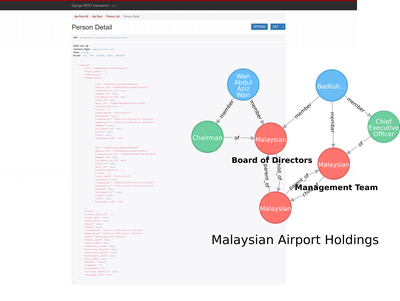 PEPs and organizations stored in central open data using Popolo provides data for users to discover organizational and post relationships in government and government linked companies, as well as a source of data for joined up data such as contracts. In addition PAC report appendices and supporting documents contain hundreds of pages of scanned detailed expenditure reports (which are generally unavailable), that should be converted to and available as open data for study and transparency. All of this takes a lot of work, but it is important and in constrained environments like Malaysia, the only way the public will ever be able to get key governance data. Shared contributions from public and researchers is needed. 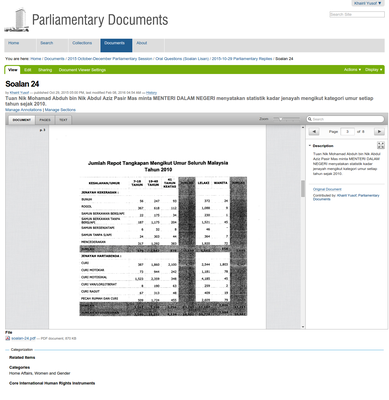 We have setup a CKAN instance at data.sinarproject.org and Parliamentary Documents group for individuals and organizations to share open data converted/extracted from parliamentary documents. Do register as a user and join the community of contributor as an individual or organization. Contact us at [email protected] if you need assistance in contributing.